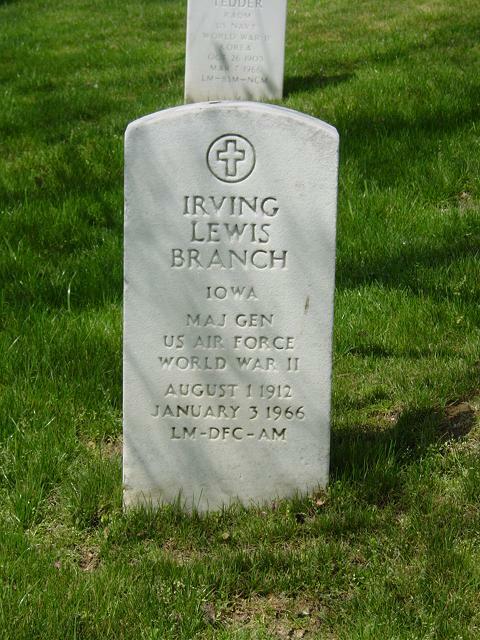 Irving Lewis ("Twig") Branch was born in Keakuk, Iowa in 1912. His father, George Irving Branch, was a civil engineer on major construction jobs that moved the family frequently. He graduated from Stamford High School at Stamford, Connecticut, in June 1930. He attended Norwich University, Northfield, Vermont, graduating with a bachelor of science degree in civil engineering in June 1934, thus following the career of his father and, also, an uncle. While at Norwich University, he was the sergeant major of the reserve unit with the grade of staff sergeant. After completing his college education, he enrolled in the Army Air Force Aviation Cadet Training Program and graduated in June 1935. His first assignment after completing flying school was as a pilot in the 1st Pursuit Group at Selfridge Field, Michigan, where he remained until October 1937. While with the First Pursuit Group, Lieutenant Branch married the former Margaret Dulaney Rogers of Bristol, Va., better known as "Jolly", June 19, 1937. With his bride, he spent his next two years as a pilot with many squadron duties at Luke Field, Hawaii, assigned to the 5th Bombardment Group. Returning to the United States, he served as operations officer of the 9th Bomb Group at Mitchel Field, New York. While still at Mitchel, he subsequently became the operations officer of the 18th Reconnaissance Group engaged in anti-submarine warfare. He was one of two officers who in January 1941, formed the headquarters at Langley Field, Virginia. He had been promoted to first lieutenant Sept. 20, 1940. This group was charged with the responsibility of anti-submarine warfare protection for the east coast. After being promoted to captain May 25, 1942, quick promotion to Major July 1, 1942, and with his anti-submarine experience, he became the liaison officer for anti-submarine warfare with the secretary of war. In July 1943, having been made a lieutenant colonel January 9, 1943, he took command of the 1st Bombardment Group of the Chinese Air Force flying B-25s. While commanding and training Chinese pilots, he was awarded Chinese Air Force Wings and the Yun-Hui decoration. Returning to the United States in September 1944, he became deputy commander of the 72nd Fighter Wing at Colorado Springs, Colorado. This wing was engaged in training all fighter pilots in the 2nd Air Force. He had been promoted in China to colonel Jan. 2, 1944. After completing the Armed Forces Staff College in September 1947, he was assigned as the assistant to the U.S. Air Force representative of the U.S. Military Staff at the United Nations. Here, he renewed many acquaintances with Chinese nationals he knew while in China. His next assignment took him to Europe where he became chief of the Air Intelligence Division of the Directorate of Intelligence for the U.S. Air Forces in Europe. He returned to the United States in August 1952, and attended the Air War College, graduating in July 1953. His next assignment placed him in a key position in the nation's nuclear program. He became the assistant chief of the Development Directorate of the Armed Forces Special Weapons Project (now renamed Defense Atomic Support Agency) in Washington. He was the chief of staff of this agency from January 1954 until September 1957, when he was transferred to Kirtland Air Force Base, New Mexico, to become the deputy commander of the Air Force Special Weapons Center. In June 1959, he was promoted to brigadier general and became the special assistant to the commander of the Air Force Special Weapons Center. He continued his work in the development of nuclear power as assistant deputy chief of staff, U.S. Air Force, for Nuclear Systems. And as head of the Aircraft Nuclear Propulsion Office, a Joint Atomic Energy Commission/Department of Defense office in Headquarters Atomic Energy Commission until July 1961, when he was designated commander of the Air Force Flight Test Center. General Branch was buried with full military honors in Section 34 of Arlington National Cemetery.